Multi SBOB and Group Winner Ch.Daoud Bashir Al Basha - "Ben"
Ben is another successful sibling of Lissa, owned by Elaine Smith. He is presently retired from the show ring. 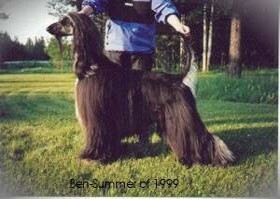 He is one of Canada's top winning afghans, gaining #2 spot in 1998 and #4 spot in 1999, at 3 and 4 years of age. He has had 18 Group 1 wins, 2 Specialty Best of Breeds wins, and numerous other Group placements. and for Bens pedigree click here.